By : Joe P | Category : Medical Malpractice | Comments Off on What’s an iatrogenic injury? It takes expertise to answer that question. Was the diagnosis correct? Why or why not? Was a complete history obtained? Did the medical provider do an exam and perform the right tests? Did the doctor ignore the tests or forgot to pay attention? Is a referral to an expert made at the proper time? Was the care timely and correctly performed? A lawyer will become a medical detective searching out the answers for you. Then the attorney becomes your advocate organizing and presenting your case to the jury. Call us. 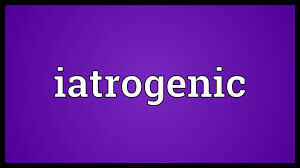 I promise I will never use the word iatrogenic while talking to the jury.